Authoritarian leaders thrive on control, especially if they are male authoritarians and they seek to control women…..and more especially if they are authoritarian religious men. We see it in the news each day, in often heart-rending reports. Whether Christian, Muslim, or Jew, authoritarian religious leaders think God is a guy who gives guys the right to control the non-guys. The Vatican’s Congregation for the Doctrine of the Faith (formerly known as the Supreme Sacred Congregation of the Roman and Universal Inquisition) now directed by Prefect Cardinal Gerhard Müller, is not happy with LCWR — the Leadership Conference of Women Religious. He told them that, as of August 1, 2014, LCWR must clear, with a bishop overseer, any assembly speakers and honorees. Next week, for instance, the Leadership Conference of Women Religious will face decisions that will move the question of the agency of women in a man’s church either forward or back. Strange as it may seem in the 21st century, the issue is whether or not women are capable of hearing diverse speakers and still remain faithful Catholics. The issue is whether or not women religious may discuss various points of view on major issues and still remain faithful Catholics. The issue is whether or not women religious can manage their own organizations and still be faithful Catholics. The Vatican’s answer to those questions is no. For the last 45 years, however, LCWR’s answer to those same questions has been a clear and persistent yes. The members of LCWR will gather August 12-16 in Nashville, Tenn., for their annual assembly. At that time, more than 800 elected leaders will discuss how they plan to react to continued charges of infidelity leveled by the church’s top enforcer of orthodoxy and the Sacred Congregation’s plans to take control over LCWR. As women were the second human creation- Adam being the first- it is likely they are an improved version of the first attempt. The nuns in the photo look like they have their mojo on full power. I have every faith they will win their battle. Equality of all people, including between the sexes, was a major issue given full Vatican approval in the second Vatican council documents. It is the responsibility of Pope Francis to speak out and uphold the basic rights and dignities afforded women, as full fledged members of the human species. If he cannot or will not do that, he is totally unfit to be the Pope and take the Church further along It’s evolutionary path. Prefect Cardinal Gerhard Muller and others of his ilk should be severely disciplined for his attitude and, if necessary, removed from his position of authority within the Church. Time for a clean sweep of any and all authoritarians, who show their true spiritual powerlessness, when they try to throw their weight around in such a way. “Things began to go wrong however, when LCWR leadership and its members became better theologically educated than many of their hierarchical critics.” When they became clearly more educated and, I would add, more obviously guided and nourished by their spirituality, the LCWR leadership became a threat to the power and (supposed) superiority of the male hierarchs. Then the hierarchs began responding in fear. What is wonderful is to witness the strength of these women – they are not afraid. Their courage and commitment to following the Spirit of Truth and Justice reveals only more clearly the contrasting fear and desperation of the hierarchy. The daily lives of women (and men) religious are framed and empowered by their prayer. Perhaps if our clergy were to adopt the prayer practice of religious, or even better to pray with the LCWR, they would have a better sense of the relationship between spirituality and justice and a more sensitive awareness of where the Spirit is blowing. Many thanks Mona…always good to hear from you. 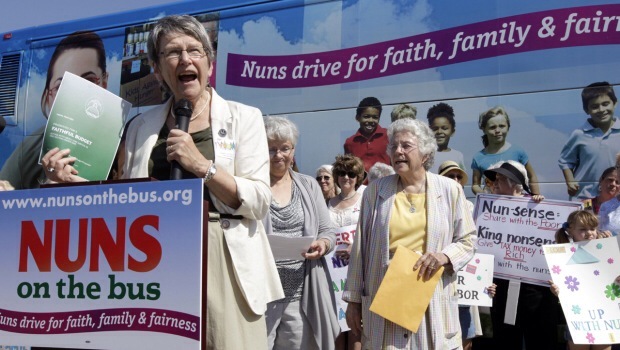 Two years ago, Pat Farrell, then president of the LCWR, and Bishop Leonard Blair, one of the triumvirate of bishops assigned to take control over the LCWR, were interviewed by Terry Gross on her NPR show Fresh Air. The contrast in tone of the two could not have been more different: Sister Farrell, talking about reflection, dialogue, compassion, and service, and Blair, stressing hierarchical orthodoxy and the need for order and control. I wish Farrell, or one of her Christ-imitating sisters were pope. It would be an affirmation that women do most of the work of the church anyway, and what a difference it would be for us to be shepherded by an engaged, loving mother instead of an irritable, rebuking father. Odd, isn’t it, that the Vatican’s latest official saint wanted to recognize Mary to co-redemptrix, but he and his heirs cannot seriously think of women continuing the work of the Redeemer. Very well said….reflection, dialogue, compassion, and service. Jesus virtues!